For the joint inflammation condition, see Synovitis. Sinusitis, also known as a sinus infection or rhinosinusitis, is inflammation of the mucous membrane that lines the sinuses resulting in symptoms. Common symptoms include thick nasal mucus, a plugged nose, and facial pain. Other signs and symptoms may include fever, headaches, a poor sense of smell, sore throat, and a cough. The cough is often worse at night. Serious complications are rare. It is defined as acute sinusitis if it lasts less than 4 weeks, and as chronic sinusitis if it lasts for more than 12 weeks. Sinusitis can be caused by infection, allergies, air pollution, or structural problems in the nose. Most cases are caused by a viral infection. A bacterial infection may be present if symptoms last more than ten days or if a person worsens after starting to improve. Recurrent episodes are more likely in persons with asthma, cystic fibrosis, and poor immune function. X-rays are not usually needed unless complications are suspected. In chronic cases confirmatory testing is recommended by either direct visualization or computed tomography. Some cases may be prevented by hand washing, avoiding smoking, and immunization. Pain killers such as naproxen, nasal steroids, and nasal irrigation may be used to help with symptoms. Recommended initial treatment for acute sinusitis is watchful waiting. If symptoms do not improve in 7–10 days or get worse, then an antibiotic may be used or changed. In those in whom antibiotics are used, either amoxicillin or amoxicillin/clavulanate is recommended first line. Surgery may occasionally be used in people with chronic disease. Sinusitis is a common condition. It affects between about 10% and 30% of people each year in the United States and Europe. Women are more often affected than men. Chronic sinusitis affects approximately 12.5% of people. Treatment of sinusitis in the United States results in more than US$11 billion in costs. The unnecessary and ineffective treatment of viral sinusitis with antibiotics is common. Acute sinusitis – A new infection that may last up to four weeks and can be subdivided symptomatically into severe and non-severe. Some use definitions up to 12 weeks. Chronic sinusitis – When the signs and symptoms last for more than 12 weeks. Roughly 90 percent of adults have had sinusitis at some point in their life. Headache/facial pain or pressure of a dull, constant, or aching sort over the affected sinuses is common with both acute and chronic stages of sinusitis. This pain is usually localized to the involved sinus and may worsen when the affected person bends over or when lying down. Pain often starts on one side of the head and progresses to both sides. Acute sinusitis may be accompanied by thick nasal discharge that is usually green in color and may contain pus or blood. Often a localized headache or toothache is present, and it is these symptoms that distinguish a sinus-related headache from other types of headaches, such as tension and migraine headaches. Another way to distinguish between toothache and sinusitis is that the pain in sinusitis is usually worsened by tilting the head forwards and with valsalva maneuvers. Infection of the eye socket is possible, which may result in the loss of sight and is accompanied by fever and severe illness. Another possible complication is the infection of the bones (osteomyelitis) of the forehead and other facial bones – Pott's puffy tumor. Sinus infections can also cause middle ear problems due to the congestion of the nasal passages. This can be demonstrated by dizziness, "a pressurized or heavy head", or vibrating sensations in the head. Post-nasal drip is also a symptom of chronic rhinosinusitis. Halitosis (bad breath) is often stated to be a symptom of chronic rhinosinusitis; however, gold standard breath analysis techniques have not been applied. Theoretically, there are several possible mechanisms of both objective and subjective halitosis that may be involved. A 2004 study suggested that up to 90% of "sinus headaches" are actually migraines. [verification needed] The confusion occurs in part because migraine involves activation of the trigeminal nerves, which innervate both the sinus region and the meninges surrounding the brain. As a result, it is difficult to accurately determine the site from which the pain originates. People with migraines do not typically have the thick nasal discharge that is a common symptom of a sinus infection. Sphenoidal – can cause pain or pressure behind the eyes, but is often felt in the top of the head, over the mastoid processes, or the back of the head. The proximity of the brain to the sinuses makes the most dangerous complication of sinusitis, particularly involving the frontal and sphenoid sinuses, infection of the brain by the invasion of anaerobic bacteria through the bones or blood vessels. Abscesses, meningitis, and other life-threatening conditions may result. In extreme cases, the patient may experience mild personality changes, headache, altered consciousness, visual problems, seizures, coma, and possibly death. Sinus infection can spread through anastomosing veins or by direct extension to close structures. Orbital complications were categorized by Chandler et al. into five stages according to their severity (see table). Contiguous spread to the orbit may result in periorbital cellulitis, subperiosteal abscess, orbital cellulitis, and abscess. Orbital cellulitis can complicate acute ethmoiditis if anterior and posterior ethmoidal veins thrombophlebitis enables the spread of the infection to the lateral or orbital side of the ethmoid labyrinth. Sinusitis may extend to the central nervous system, where it may cause cavernous sinus thrombosis, retrograde meningitis, and epidural, subdural, and brain abscesses. Orbital symptoms frequently precede intracranial spread of the infection . Other complications include sinobronchitis, maxillary osteomyelitis, and frontal bone osteomyelitis. Osteomyelitis of the frontal bone often originates from a spreading thrombophlebitis. A periostitis of the frontal sinus causes an osteitis and a periostitis of the outer membrane, which produces a tender, puffy swelling of the forehead. The diagnosis of these complications can be assisted by noting local tenderness and dull pain, and can be confirmed by CT and nuclear isotope scanning. The most common microbial causes are anaerobic bacteria and S. aureus. Treatment includes performing surgical drainage and administration of antimicrobial therapy. Surgical debridement is rarely required after an extended course of parenteral antimicrobial therapy. Antibiotics should be administered for at least 6 weeks. Continuous monitoring of patients for possible intracranial complication is advised. Maxillary sinusitis may also develop from problems with the teeth, and these cases make up between 10 and 40% of cases. The cause of this situation is usually a periapical or periodontal infection of a maxillary posterior tooth, where the inflammatory exudate has eroded through the bone superiorly to drain into the maxillary sinus. 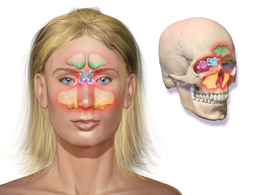 Once an odontogenic infection involves the maxillary sinus, it is possible that it may then spread to the orbit or to the ethmoid sinus, the nasal cavity, and frontal sinuses, and in unusual instances can spread from the maxillary sinus causing orbital cellulitis, blindness, meningitis, subdural empyema, brain abscess and life-threatening cavernous sinus thrombosis. Limited field CBCT imaging, as compared to periapical radiographs, improves the ability to detect the teeth as the sources for sinusitis. Treatment focuses on removing the infection and preventing reinfection, by removing of the microorganisms, their by-products, and pulpal debris from the infected root canal. Systemic antibiotics is ineffective as a definitive solution, but may afford temporary relief of symptoms by improving sinus clearing, and may be appropriate for rapidly spreading infections, but debridement and disinfection of the root canal system at the same time is necessary. Chronic sinusitis can also be caused indirectly through a common but slight abnormality in the auditory or eustachian tube, which is connected to the sinus cavities and the throat. Other diseases such as cystic fibrosis and granulomatosis with polyangiitis can also cause chronic sinusitis. This tube is usually almost level with the eye sockets, but when this sometimes hereditary abnormality is present, it is below this level and sometimes level with the vestibule or nasal entrance. Acute sinusitis is usually precipitated by an earlier upper respiratory tract infection, generally of viral origin, mostly caused by rhinoviruses, coronaviruses, and influenza viruses, others caused by adenoviruses, human parainfluenza viruses, human respiratory syncytial virus, enteroviruses other than rhinoviruses, and metapneumovirus. If the infection is of bacterial origin, the most common three causative agents are Streptococcus pneumoniae, Haemophilus influenzae, and Moraxella catarrhalis. Until recently, Haemophilus influenzae was the most common bacterial agent to cause sinus infections. However, introduction of the H. influenza type B (Hib) vaccine has dramatically decreased H. influenza type B infections and now non-typable H. influenza (NTHI) are predominantly seen in clinics. Other sinusitis-causing bacterial pathogens include Staphylococcus aureus and other streptococci species, anaerobic bacteria and, less commonly, gram negative bacteria. Viral sinusitis typically lasts for 7 to 10 days, whereas bacterial sinusitis is more persistent. Approximately 0.5% to 2% of viral sinusitis results in subsequent bacterial sinusitis. It is thought that nasal irritation from nose blowing leads to the secondary bacterial infection. Acute episodes of sinusitis can also result from fungal invasion. These infections are typically seen in patients with diabetes or other immune deficiencies (such as AIDS or transplant patients on immunosuppressive anti-rejection medications) and can be life-threatening. In type I diabetics, ketoacidosis can be associated with sinusitis due to mucormycosis. Chemical irritation can also trigger sinusitis, commonly from cigarette smoke and chlorine fumes. It may also be caused by a tooth infection. By definition chronic sinusitis lasts longer than 12 weeks and can be caused by many different diseases that share chronic inflammation of the sinuses as a common symptom. Symptoms of chronic sinusitis may include any combination of the following: nasal congestion, facial pain, headache, night-time coughing, an increase in previously minor or controlled asthma symptoms, general malaise, thick green or yellow discharge, feeling of facial 'fullness' or 'tightness' that may worsen when bending over, dizziness, aching teeth, and/or bad breath. Each of these symptoms has multiple other possible causes, which should be considered and investigated as well. Often chronic sinusitis can lead to anosmia, the inability to smell objects. In a small number of cases, acute or chronic maxillary sinusitis is associated with a dental infection. Vertigo, lightheadedness, and blurred vision are not typical in chronic sinusitis and other causes should be investigated. Chronic sinusitis cases are subdivided into cases with polyps and cases without polyps. When polyps are present, the condition is called chronic hyperplastic sinusitis; however, the causes are poorly understood and may include allergy, environmental factors such as dust or pollution, bacterial infection, or fungus (either allergic, infective, or reactive). Chronic rhinosinusitis represents a multifactorial inflammatory disorder, rather than simply a persistent bacterial infection. The medical management of chronic rhinosinusitis is now focused upon controlling the inflammation that predisposes patients to obstruction, reducing the incidence of infections. However, all forms of chronic rhinosinusitis are associated with impaired sinus drainage and secondary bacterial infections. Most individuals require initial antibiotics to clear any infection and intermittently afterwards to treat acute exacerbations of chronic rhinosinusitis. A combination of anaerobic and aerobic bacteria are detected in conjunction with chronic sinusitis. Also isolated are Staphylococcus aureus, including methicillin-resistant S. aureus, and coagulase-negative Staphylococci and gram-negative enteric bacteria can be isolated. A more recent, and still debated, development in chronic sinusitis is the role that fungi play in this disease. It remains unclear if fungi are a definite factor in the development of chronic sinusitis and if they are, what the difference may be between those who develop the disease and those who remain free of symptoms. Trials of antifungal treatments have had mixed results. Recent theories of sinusitis indicate that it often occurs as part of a spectrum of diseases that affect the respiratory tract (i.e., the "one airway" theory) and is often linked to asthma. All forms of sinusitis may either result in, or be a part of, a generalized inflammation of the airway, so other airway symptoms, such as cough, may be associated with it. Both smoking and secondhand smoke are associated with chronic rhinosinusitis. It has been hypothesized that biofilm bacterial infections may account for many cases of antibiotic-refractory chronic sinusitis. Biofilms are complex aggregates of extracellular matrix and inter-dependent microorganisms from multiple species, many of which may be difficult or impossible to isolate using standard clinical laboratory techniques. Bacteria found in biofilms have their antibiotic resistance increased up to 1000 times when compared to free-living bacteria of the same species. A recent study found that biofilms were present on the mucosa of 75% of people undergoing surgery for chronic sinusitis. Health care providers distinguish bacterial and viral sinusitis by watchful waiting. If a person has had sinusitis for fewer than 10 days without the symptoms becoming worse, then the infection is presumed to be viral. When symptoms last more than 10 days or get worse in that time, then the infection is considered bacterial sinusitis. Imaging by either X-ray, CT or MRI is generally not recommended unless complications develop. Pain caused by sinusitis is sometimes confused for pain caused by pulpitis (toothache) of the maxillary teeth, and vice versa. Classically, the increased pain when tilting the head forwards separates sinusitis from pulpitis. For sinusitis lasting more than 12 weeks a CT scan is recommended. On a CT scan, acute sinus secretions have a radiodensity of 10 to 25 Hounsfield units (HU), but in a more chronic state they become more viscous, with a radiodensity of 30 to 60 HU. Nasal endoscopy and clinical symptoms are also used to make a positive diagnosis. A tissue sample for histology and cultures can also be collected and tested. Allergic fungal sinusitis (AFS) is often seen in people with asthma and nasal polyps. In rare cases, sinusoscopy may be made. Nasal endoscopy involves inserting a flexible fiber-optic tube with a light and camera at its tip into the nose to examine the nasal passages and sinuses. This is generally a completely painless (although uncomfortable) procedure which takes between five and ten minutes to complete. CT scan of chronic sinusitis, showing a filled right maxillary sinus with sclerotic thickened bone. MRI image showing sinusitis. Edema and mucosal thickening appears in both maxillary sinuses. 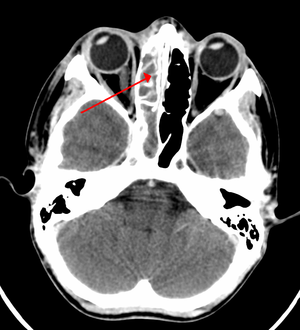 X-ray of left-sided maxillary sinusitis marked by an arrow. There is lack of the air transparency indicating fluid in contrast to the other side. Time Viral and some bacterial sinusitis Sinusitis is usually caused by a virus which is not affected by antibiotics. Antibiotics Bacterial sinusitis Cases accompanied by extreme pain, skin infection, or which last a long time may be caused by bacteria. Nasal irrigation Nasal congestion Can provide relief by helping decongest. Drink liquids Thick phlegm Remaining hydrated loosens mucus. Antihistamines Concern with allergies Antihistamines do not relieve typical sinusitis or cold symptoms much; this treatment is not needed in most cases. Nasal spray Desire for temporary relief Tentative evidence that it helps symptoms. Does not treat cause. Not recommended for more than three days' use. Recommended treatments for most cases of sinusitis include rest and drinking enough water to thin the mucus. Antibiotics are not recommended for most cases. Breathing low-temperature steam such as from a hot shower or gargling can relieve symptoms. There is tentative evidence for nasal irrigation in acute sinusitis, for example during upper respiratory infections. Decongestant nasal sprays containing oxymetazoline may provide relief, but these medications should not be used for more than the recommended period. Longer use may cause rebound sinusitis. It is unclear if nasal irrigation, antihistamines, or decongestants work in children with acute sinusitis. Most sinusitis cases are caused by viruses and resolve without antibiotics. However, if symptoms do not resolve within 10 days, amoxicillin is a reasonable antibiotic for first treatment, with amoxicillin/clavulanate being indicated if symptoms do not improve after 7 days on amoxicillin alone. A 2012 Cochrane review, however, found only a small benefit between 7 and 14 days, and could not recommend the practice when compared to potential complications and risk of developing resistance. [needs update] Antibiotics are specifically not recommended in those with mild / moderate disease during the first week of infection due to risk of adverse effects, antibiotic resistance, and cost. Fluoroquinolones, and a newer macrolide antibiotic such as clarithromycin or a tetracycline like doxycycline, are used in those who have severe allergies to penicillins. Because of increasing resistance to amoxicillin the 2012 guideline of the Infectious Diseases Society of America recommends amoxicillin-clavulanate as the initial treatment of choice for bacterial sinusitis. The guidelines also recommend against other commonly used antibiotics, including azithromycin, clarithromycin, and trimethoprim/sulfamethoxazole, because of growing antibiotic resistance. The FDA recommends against the use of fluoroquinolones when other options are available due to higher risks of serious side effects. A short-course (3–7 days) of antibiotics seems to be just as effective as the typical longer-course (10–14 days) of antibiotics for those with clinically diagnosed acute bacterial sinusitis without any other severe disease or complicating factors. The IDSA guideline suggest five to seven days of antibiotics is long enough to treat a bacterial infection without encouraging resistance. The guidelines still recommend children receive antibiotic treatment for ten days to two weeks. For unconfirmed acute sinusitis, nasal sprays using corticosteroids have not been found to be better than a placebo either alone or in combination with antibiotics. For cases confirmed by radiology or nasal endoscopy, treatment with corticosteroids alone or in combination with antibiotics is supported. The benefit, however, is small. There is only limited evidence to support short treatment with oral corticosteroids for chronic rhinosinusitis with nasal polyps. For chronic or recurring sinusitis, referral to an otolaryngologist may be indicated, and treatment options may include nasal surgery. Surgery should only be considered for those people who do not benefit with medication. It is unclear how benefits of surgery compare to medical treatments in those with nasal polyps as this has been poorly studied. Maxillary antral washout involves puncturing the sinus and flushing with saline to clear the mucus. A 1996 study of patients with chronic sinusitis found that washout confers no additional benefits over antibiotics alone. A number of surgical approaches can be used to access the sinuses and these have generally shifted from external/extranasal approaches to intranasal endoscopic ones. The benefit of functional endoscopic sinus surgery (FESS) is its ability to allow for a more targeted approach to the affected sinuses, reducing tissue disruption, and minimizing post-operative complications. The use of drug eluting stents such as propel mometasone furoate implant may help in recovery after surgery. Another recently developed treatment is balloon sinuplasty. This method, similar to balloon angioplasty used to "unclog" arteries of the heart, utilizes balloons in an attempt to expand the openings of the sinuses in a less invasive manner. For persistent symptoms and disease in patients who have failed medical and the functional endoscopic approaches, older techniques can be used to address the inflammation of the maxillary sinus, such as the Caldwell-luc antrostomy. This surgery involves an incision in the upper gum, opening in the anterior wall of the antrum, removal of the entire diseased maxillary sinus mucosa and drainage is allowed into inferior or middle meatus by creating a large window in the lateral nasal wall. Sinusitis is a common condition, with between 24 and 31 million cases occurring in the United States annually. Chronic sinusitis affects approximately 12.5% of people. Based on recent theories on the role that fungus may play in the development of chronic sinusitis, antifungal treatments have been used, on a trial basis. These trials have had mixed results. ^ a b c d e f g h i j k l m n o p q r s t u v w x Rosenfeld, RM; Piccirillo, JF; Chandrasekhar, SS; Brook, I; Ashok Kumar, K; Kramper, M; Orlandi, RR; Palmer, JN; Patel, ZM; Peters, A; Walsh, SA; Corrigan, MD (April 2015). "Clinical practice guideline (update): adult sinusitis executive summary". Otolaryngology–Head and Neck Surgery. 152 (4): 598–609. doi:10.1177/0194599815574247. PMID 25833927. ^ a b c d e f g "Sinus Infection (Sinusitis)". cdc.gov. September 30, 2013. Archived from the original on 7 April 2015. Retrieved 6 April 2015. ^ a b c d "What Are the Symptoms of Sinusitis?". April 3, 2012. Archived from the original on 5 April 2015. Retrieved 6 April 2015. ^ "Migraines vs. Sinus Headaches". American Migraine Foundation. Retrieved 2017-10-23. ^ a b c d King, D; Mitchell, B; Williams, CP; Spurling, GK (20 April 2015). "Saline nasal irrigation for acute upper respiratory tract infections" (PDF). The Cochrane Database of Systematic Reviews. 4 (4): CD006821. doi:10.1002/14651858.CD006821.pub3. PMID 25892369. ^ a b Adkinson, N. Franklin (2014). Middleton's allergy: principles and practice (Eight ed.). Philadelphia: Elsevier Saunders. p. 687. ISBN 9780323085939. Archived from the original on 2016-06-03. ^ a b Head, K; Chong, LY; Piromchai, P; Hopkins, C; Philpott, C; Schilder, AG; Burton, MJ (26 April 2016). "Systemic and topical antibiotics for chronic rhinosinusitis". The Cochrane Database of Systematic Reviews. 4: CD011994. doi:10.1002/14651858.CD011994.pub2. PMID 27113482. ^ "How Is Sinusitis Treated?". April 3, 2012. Archived from the original on 5 April 2015. Retrieved 6 April 2015. ^ "Sinusitis". U.S. National Institute of Allergy and Infectious Diseases. April 3, 2012. Archived from the original on 4 April 2015. Retrieved 6 April 2015. ^ a b c Hamilos DL (October 2011). "Chronic rhinosinusitis: epidemiology and medical management". The Journal of Allergy and Clinical Immunology. 128 (4): 693–707, quiz 708–9. doi:10.1016/j.jaci.2011.08.004. PMID 21890184. ^ a b c Christine Radojicic. "Sinusitis". Disease Management Project. Cleveland Clinic. Archived from the original on November 14, 2012. Retrieved November 26, 2012. ^ Pearlman AN, Conley DB (June 2008). "Review of current guidelines related to the diagnosis and treatment of rhinosinusitis". Current Opinion in Otolaryngology & Head and Neck Surgery. 16 (3): 226–30. doi:10.1097/MOO.0b013e3282fdcc9a. PMID 18475076. ^ a b c "Sinusitus Complications". Patient Education. University of Maryland. Archived from the original on 2010-02-22. ^ a b c Ferguson, M (May 23, 2014). "Rhinosinusitis in oral medicine and dentistry". Australian Dental Journal. 59 (3): 289–295. doi:10.1111/adj.12193. PMID 24861778. ^ Schreiber CP, Hutchinson S, Webster CJ, Ames M, Richardson MS, Powers C (2004). "Prevalence of migraine in patients with a history of self-reported or physician-diagnosed "sinus" headache". Arch. Intern. Med. 164 (16): 1769–72. doi:10.1001/archinte.164.16.1769. PMID 15364670. ^ Mehle ME, Schreiber CP (2005). "Sinus headache, migraine, and the otolaryngologist". Otolaryngol Head Neck Surg. 133 (4): 489–96. doi:10.1016/j.otohns.2005.05.659. PMID 16213917. ^ Headache Classification Subcommittee of the International Headache Society (2004). "The International Classification of Headache Disorders: 2nd edition". Cephalalgia. 24 (Suppl 1): 9–160. doi:10.1111/j.1468-2982.2004.00653.x. PMID 14979299. ^ Chandler JR, Langenbrunner DJ, Stevens ER (September 1970). "The pathogenesis of orbital complications in acute sinusitis". Laryngoscope. 80 (9): 1414–28. doi:10.1288/00005537-197009000-00007. PMID 5470225. ^ Baker AS (September 1991). "Role of anaerobic bacteria in sinusitis and its complications". Ann Otol Rhinol Laryngol Suppl. 154: 17–22. PMID 1952679. ^ Clayman GL, Adams GL, Paugh DR, Koopmann CF (March 1991). "Intracranial complications of paranasal sinusitis: a combined institutional review". Laryngoscope. 101 (3): 234–9. doi:10.1288/00005537-199103000-00003. PMID 2000009. ^ Arjmand EM, Lusk RP, Muntz HR (November 1993). "Pediatric sinusitis and subperiosteal orbital abscess formation: diagnosis and treatment". Otolaryngol Head Neck Surg. 109 (5): 886–94. doi:10.1177/019459989310900518. PMID 8247570. ^ Harris GJ (March 1994). "Subperiosteal abscess of the orbit. Age as a factor in the bacteriology and response to treatment". Ophthalmology. 101 (3): 585–95. doi:10.1016/S0161-6420(94)31297-8. PMID 8127580. ^ Dill SR, Cobbs CG, McDonald CK (February 1995). "Subdural empyema: analysis of 32 cases and review". Clin. Infect. Dis. 20 (2): 372–86. doi:10.1093/clinids/20.2.372. PMID 7742444. ^ Stankiewicz JA, Newell DJ, Park AH (August 1993). "Complications of inflammatory diseases of the sinuses". Otolaryngol. Clin. North Am. 26 (4): 639–55. PMID 7692375. ^ Workman, AD; Granquist, EJ; Adappa, ND (February 2018). "Odontogenic sinusitis: developments in diagnosis, microbiology, and treatment". Current opinion in otolaryngology & head and neck surgery. 26 (1): 27–33. doi:10.1097/MOO.0000000000000430. PMID 29084007. ^ Hupp JR, Ellis E, Tucker MR (2008). Contemporary oral and maxillofacial surgery (5th ed.). St. Louis, Mo. : Mosby Elsevier. pp. 317–333. ISBN 9780323049030. ^ a b c d "Maxillary Sinusitis of Endodontic Origin" (PDF). American Association of Endodontists. 2018. Retrieved 26 March 2019. ^ a b c d e f g h i Leung RS, Katial R (March 2008). "The diagnosis and management of acute and chronic sinusitis". Primary Care. 35 (1): 11–24, v–vi. doi:10.1016/j.pop.2007.09.002. PMID 18206715. ^ Gwaltney JM, Hendley JO, Phillips CD, Bass CR, Mygind N, Winther B (February 2000). "Nose blowing propels nasal fluid into the paranasal sinuses". Clin. Infect. Dis. 30 (2): 387–91. doi:10.1086/313661. PMID 10671347. ^ Gelfand, Jonathan L. "Help for Sinus Pain and Pressure". WebMD.com. Archived from the original on 24 September 2011. Retrieved 2 October 2011. ^ Chakrabarti A, Denning DW, Ferguson BJ, Ponikau J, Buzina W, Kita H, Marple B, Panda N, Vlaminck S, Kauffmann-Lacroix C, Das A, Singh P, Taj-Aldeen SJ, Kantarcioglu AS, Handa KK, Gupta A, Thungabathra M, Shivaprakash MR, Bal A, Fothergill A, Radotra BD (September 2009). "Fungal rhinosinusitis: a categorization and definitional schema addressing current controversies". Laryngoscope. 119 (9): 1809–18. doi:10.1002/lary.20520. PMC 2741302. PMID 19544383. ^ S; Boodman, ra G. (1999-11-23). "Mayo Report on Sinusitis Draws Skeptics". Washington Post. ISSN 0190-8286. Retrieved 2018-06-01. ^ Grossman J (1997). "One airway, one disease". Chest. 111 (2 Suppl): 11S–16S. doi:10.1378/chest.111.2_Supplement.11S. PMID 9042022. ^ Cruz AA (2005). "The 'united airways' require an holistic approach to management". Allergy. 60 (7): 871–4. doi:10.1111/j.1398-9995.2005.00858.x. PMID 15932375. ^ Palmer JN (2005). "Bacterial biofilms: do they play a role in chronic sinusitis?". Otolaryngol. Clin. North Am. 38 (6): 1193–201, viii. doi:10.1016/j.otc.2005.07.004. PMID 16326178. ^ Ramadan HH, Sanclement JA, Thomas JG (2005). "Chronic rhinosinusitis and biofilms". Otolaryngol Head Neck Surg. 132 (3): 414–7. doi:10.1016/j.otohns.2004.11.011. PMID 15746854. ^ Bendouah Z, Barbeau J, Hamad WA, Desrosiers M (2006). "Biofilm formation by Staphylococcus aureus and Pseudomonas aeruginosa is associated with an unfavorable evolution after surgery for chronic sinusitis and nasal polyposis". Otolaryngol Head Neck Surg. 134 (6): 991–6. doi:10.1016/j.otohns.2006.03.001. PMID 16730544. ^ Lewis, Kim; Salyers, Abagail A.; Taber, Harry W.; Wax, Richard G., eds. (2002). Bacterial Resistance to Antimicrobials. New York: Marcel Decker. ISBN 978-0-8247-0635-7. Archived from the original on 2014-01-07. ^ Sanclement JA, Webster P, Thomas J, Ramadan HH (2005). "Bacterial biofilms in surgical specimens of patients with chronic rhinosinusitis". Laryngoscope. 115 (4): 578–82. doi:10.1097/01.mlg.0000161346.30752.18. PMID 15805862. ^ a b c d Rosenfeld RM, Andes D, Bhattacharyya N, Cheung D, Eisenberg S, Ganiats TG, Gelzer A, Hamilos D, Haydon RC, Hudgins PA, Jones S, Krouse HJ, Lee LH, Mahoney MC, Marple BF, Mitchell CJ, Nathan R, Shiffman RN, Smith TL, Witsell DL (September 2007). "Clinical practice guideline: adult sinusitis". Otolaryngology–Head and Neck Surgery. 137 (3 Suppl): S1–31. doi:10.1016/j.otohns.2007.06.726. PMID 17761281. ^ a b c d e f g Consumer Reports; American Academy of Family Physicians (April 2012). "Treating sinusitis: Don't rush to antibiotics" (PDF). Choosing wisely: an initiative of the ABIM Foundation. Consumer Reports. Archived (PDF) from the original on June 11, 2012. Retrieved August 17, 2012. ^ Lemiengre, MB; van Driel, ML; Merenstein, D; Liira, H; Mäkelä, M; De Sutter, AI (10 September 2018). "Antibiotics for acute rhinosinusitis in adults". The Cochrane Database of Systematic Reviews. 9: CD006089. doi:10.1002/14651858.CD006089.pub5. PMID 30198548. ^ Shaikh, N; Wald, ER (Oct 27, 2014). "Decongestants, antihistamines and nasal irrigation for acute sinusitis in children". The Cochrane Database of Systematic Reviews. 10 (10): CD007909. doi:10.1002/14651858.CD007909.pub4. PMC 4933076. PMID 25347280. ^ Lemiengre, Marieke B; van Driel, Mieke L; Merenstein, Dan; Young, James; De Sutter, An IM (2012-10-17). "Cochrane Database of Systematic Reviews". Cochrane Database of Systematic Reviews. 10: CD006089. doi:10.1002/14651858.cd006089.pub4. PMID 23076918. ^ Smith SR, Montgomery LG, Williams JW (Mar 26, 2012). "Treatment of mild to moderate sinusitis". Archives of Internal Medicine. 172 (6): 510–3. doi:10.1001/archinternmed.2012.253. PMID 22450938. ^ Karageorgopoulos DE, Giannopoulou KP, Grammatikos AP, Dimopoulos G, Falagas ME (March 2008). "Fluoroquinolones compared with beta-lactam antibiotics for the treatment of acute bacterial sinusitis: a meta-analysis of randomized controlled trials". CMAJ. 178 (7): 845–54. doi:10.1503/cmaj.071157. PMC 2267830. PMID 18362380. ^ a b Chow AW, Benninger MS, Brook I, Brozek JL, Goldstein EJ, Hicks LA, Pankey GA, Seleznick M, Volturo G, Wald ER, File TM (April 2012). "IDSA clinical practice guideline for acute bacterial rhinosinusitis in children and adults". Clinical Infectious Diseases. 54 (8): e72–e112. doi:10.1093/cid/cir1043. PMID 22438350. ^ Falagas ME, Karageorgopoulos DE, Grammatikos AP, Matthaiou DK (February 2009). "Effectiveness and safety of short vs. long duration of antibiotic therapy for acute bacterial sinusitis: a meta-analysis of randomized trials". Br J Clin Pharmacol. 67 (2): 161–71. doi:10.1111/j.1365-2125.2008.03306.x. PMC 2670373. PMID 19154447. Archived from the original on 2013-01-05. ^ Williamson IG, Rumsby K, Benge S, Moore M, Smith PW, Cross M, Little P (2007). "Antibiotics and Topical Nasal Steroid for Treatment of Acute Maxillary Sinusitis". JAMA. 298 (21): 2487–96. doi:10.1001/jama.298.21.2487. PMID 18056902. ^ Zalmanovici Trestioreanu, A; Yaphe, J (2 December 2013). "Intranasal steroids for acute sinusitis". The Cochrane Database of Systematic Reviews. 12 (12): CD005149. doi:10.1002/14651858.CD005149.pub4. PMID 24293353. ^ Hayward G, Heneghan C, Perera R, Thompson M (2012). "Intranasal corticosteroids in management of acute sinusitis: a systematic review and meta-analysis". Annals of Family Medicine. 10 (3): 241–9. doi:10.1370/afm.1338. PMC 3354974. PMID 22585889. ^ a b Fokkens W, Lund V, Mullol J (2007). "European Position Paper on Rhinosinusitis and Nasal Polyps 2007". Rhinol Suppl. 16 (20): 1–136. doi:10.1017/S0959774306000060. PMID 17844873. ^ Thomas M, Yawn BP, Price D, Lund V, Mullol J, Fokkens W (June 2008). "EPOS Primary Care Guidelines: European Position Paper on the Primary Care Diagnosis and Management of Rhinosinusitis and Nasal Polyps 2007 – a summary". Prim Care Respir J. 17 (2): 79–89. doi:10.3132/pcrj.2008.00029. PMID 18438594. ^ Tichenor WS (2007-04-22). "FAQ — Sinusitis". Archived from the original on 2007-11-01. Retrieved 2007-10-28. ^ Rimmer, J; Fokkens, W; Chong, LY; Hopkins, C (1 December 2014). "Surgical versus medical interventions for chronic rhinosinusitis with nasal polyps". The Cochrane Database of Systematic Reviews. 12 (12): CD006991. doi:10.1002/14651858.CD006991.pub2. PMID 25437000. ^ Pang YT, Willatt DJ (1996). "Do antral washouts have a place in the current management of chronic sinusitis?". The Journal of Laryngology and Otology. 110 (10): 926–928. doi:10.1017/s0022215100135376. PMID 8977854. ^ Stammberger H (February 1986). "Endoscopic endonasal surgery—concepts in treatment of recurring rhinosinusitis. Part I. Anatomic and pathophysiologic considerations". Otolaryngol Head Neck Surg. 94 (2): 143–7. doi:10.1177/019459988609400202. PMID 3083326. ^ Liang J, Lane AP (2013). "Topical Drug Delivery for Chronic Rhinosinusitis". Current Otorhinolaryngology Reports. 1 (1): 51–60. doi:10.1007/s40136-012-0003-4. PMC 3603706. PMID 23525506. ^ Anon JB (April 2010). "Upper respiratory infections". Am. J. Med. 123 (4 Suppl): S16–25. doi:10.1016/j.amjmed.2010.02.003. PMID 20350632. ^ Dykewicz MS, Hamilos DL (February 2010). "Rhinitis and sinusitis". The Journal of Allergy and Clinical Immunology. 125 (2 Suppl 2): S103–15. doi:10.1016/j.jaci.2009.12.989. PMID 20176255.